Note (Latest News: February 27, 2018): Amazon has acquired Ring, California-based smart doorbell maker, GeekWire reported on February 27, 2018 (Bishop, Soper, & Levy, 2018). Reuters later reported that the deal is worth more than a billion dollars (Bell, 2018). It is no secret that Amazon has been dominating the online retail sales in the US. According to Business Insider report, 53% of all online purchases in the US went through Amazon in 2016. The rest 47% were from all other retailers combined. To put this into perspective, for every dollar people spent online in 2016, 53 cents went to Amazon alone while all other competitors were left to compete and share the remaining 47 cents. Amazon has been building its momentum for years. According to Macquarie Research, Amazon accounted for 51% of all e-commerce growth in 2015, compared to 36% in 2014 and 33% in 2013. Now more than 50% of all online sales in the US every year go through Amazon alone and it continues to grow. Walmart, one of the largest retailer in the US, has been struggling to play catch-up in online sales. It is looking to make a bigger splash in the e-commerce market in 2018. Immediately after Amazon acquired Whole Foods in 2017, Walmart announced to acquire online men’s fashion retailer Bonobos for $310 million as it seeks to bridge the gap with e-commerce leader Amazon. In 2016, they agreed to buy another online retailer, Jet.com for $3.3 billion and most of that in cash. The deal was closed on Sept. 19, 2016. You could say Walmart has been doing some online shopping themselves, a move to increase their online presence and narrow the enormous gap with the internet giant Amazon. Acquiring Bonobos and Jet.com gives Walmart a leg up as it is doing everything it can to gain some momentum in online apparel sales. Jet.com, one of the largest e-commerce startup, uses a software that enables customers to lower prices as they add more items to their shopping cart- giving incentive for buyers to keep adding more items in order to build an efficient cart. The acquisition of Jet.com would give Walmart access to their software which they can integrate on its main website to reach an even wider audience online. Walmart said, Jet.com and Walmart.com will operate as separate brands and will integrate Jet’s software into Walmart.com. Marc Lore, Founder and CEO of Jet.com, have joined Walmart’s leadership team as Executive Vice President of Walmart and CEO of Walmart e-commerce. He will continue to run Jet.com as well as oversee Walmart’s e-commerce. Lore previously sold his first e-commerce business, Quidsi Inc., the parent of Diapers.com and Soap.com, to Amazon in 2010 for $540 million. Amazon in 2017 announced that they are shutting down its Quidsi unit after failing to make a profit. Amazon also acquired another giant online shoe retailer Zappos for roughly $1.2 billion in 2009. On December 6, 2017, Walmart announced they are changing its official name from ‘Wal-Mart Stores’ to ‘Walmart’, effective February 1, 2018. Walmart has been working aggressively to transform itself into a dominant force and even changing its name to reflect its increasing emphasis on e-commerce. Some of the other changes include revamping its main webpage and adding more products to its website. After acquiring Jet.com, Walmart proceeded to acquire other online retailers under Jet.com and Lore is going to be overseeing all Walmart’s e-commerce business. One of the acquisition was the online footwear retailer ShoeBuy for approximately $70 million. According to Walmart, the deal was closed on Dec 30, 2016. ShoeBuy is one of the biggest competitors of Amazon-owned Zappos. In 2016, Walmart acquired Hayneedle, a 14-year-old online furniture retailer, for $90 million. In 2017, Walmart acquired ModCloth, one of the top online retailer that offers vintage-styled clothing and branding, along with shoes and handbags. ModCloth CEO Matthew Kaness and his executive team will be joining the Walmart’s leadership team, and ModCloth will now operate under Jet.com. On Jan. 2016, the company announced it is closing down 269 stores globally, with 154 of them in the US, according to a Walmart press release. It only accounts for a fraction of the company’s 11,600 stores worldwide. On Jan. 2018, without notice Walmart closed 10% of all Sam’s Clubs, leaving more than 10,000 employees without work. It will be closing 63 total Sam’s Club stores, reducing the stores to 597 from 660 units. According to Forbes, Walmart will be converting 12 of those closed Sam’s Club stores into e-commerce fulfillment centers. Earlier this month, Walmart announced that it is raising the minimum wage from $9 to $11. If there is one thing that has been rapidly growing over the last decade, it is online shopping. In today’s digital age, online shopping is more accessible now than it has ever been and consumers continue to increasingly shift spending online. And it continues to grow. 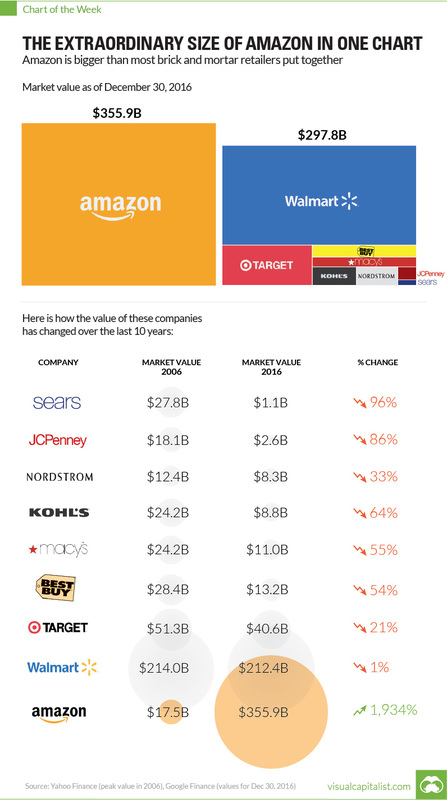 All these changes may not tell a whole lot, but it certainly does begin to paint a picture of changing dynamic of the e-commerce businesses- not just in the USA but also around the world.